Jesus Christ! And Abraham, too! Next to Orpheus and Apollonius? Why in heaven's name is a pagan emperor of Rome worshipping such a mixed bag of souls in his private chapel? Utter nonsense, I would have thought, and typical of the unreliable Historiae Augustae at its most fanciful. But, then, I had not reckoned with the Underground Tomb of the Aureli. 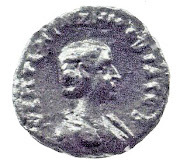 For no sooner had Alexander Severus -- and his mother, Julia Mamaea -- been murdered by mutinous soldiers far away in upper Germany (that story ends my series of More Uppity Women) than a freedman named Aurelius Felicissimus began to build an elaborate and ambitious tomb for himself (235-240 CE) in Rome. The richly decorated tomb consists of three rooms, two of them underground, which were used for burials. A mosaic inscription in the floor tells us that he built the tomb for his sister Aurelia Prima (described as a virgin), his two brothers, and for fellow freedmen ... fratris et conlibertis. This suggests that the space was intended for use by a select group of religious 'brothers', seemingly some kind of alternative cult community. Scholars have never been able to decide on the identity of this group. Were they Gnostics, Pythagorian Gnostics, heretical Christians, or even a pagan syncretic burial club? The thousand political, social, economic and military problems of the century were reflected in philosophic and religious thought combining Roman ideology with the new beliefs and faiths coming from the East. The cult of Mithra, Judaism, Neo-Platonic philosophy, Orphism, Christianity and Gnosticism co-existed in a multi-ethnic and multi-religious Rome, creating a complex layering of religious expression. The tomb of the Aureli expresses this complexity as the burial place of a family of a high and striving social class, perhaps members of the entourage of freed slaves who became part of the Emperor’s court, and who emulated their betters by creating monumental funeral displays. The mural decorations in the tomb contained new iconographic images suspended between daily life and the tranquil, blessed world of the beyond, while maintaining elements of Greek culture and Roman tradition. Two great themes are incorporated into the frescoes: philosophy, which depicts a group of intellectuals holding wands and scrolls of wisdom, and bucolic scenes, represented by a shepherd with his sheep (the Good Shepherd?). A curious combination of the two themes may seen in a bearded character in the act of reading a scroll while a flock of sheep grazes at his feet, which perhaps refers to one of the Aureli buried in the tomb. 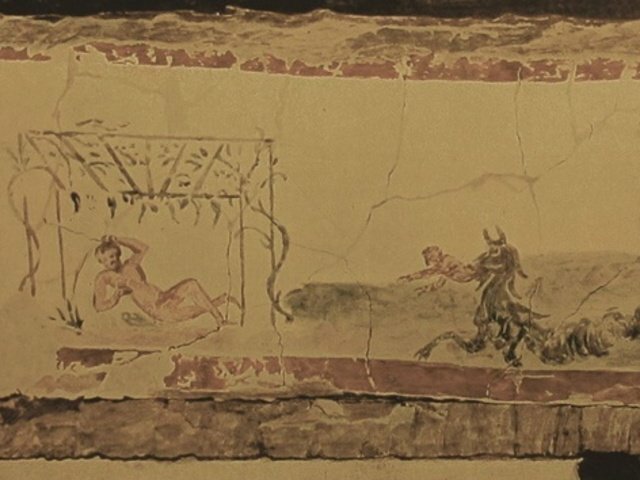 Nearby, we see scenes from the Homeric cycle representing Odysseus returning to Ithaca to find Penelope at the loom being pestered by a row of naked suitors. These are many such pagan scenes ... but are the Aureli pagans? 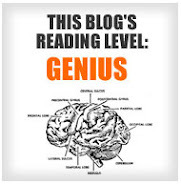 That depends on how we read the pictures. For example, one scene that has long been interpreted as Adam and Eve with the tempting serpent and fatal apples is thrown into doubt because the couple is shown without sexual shame; some scholars now think that it illustrates the pagan theme of Heracles and the apples in the garden of the Hesperides. The recent restoration of the frescoes, using a revolutionary laser technique, offers a closer reading of some images. 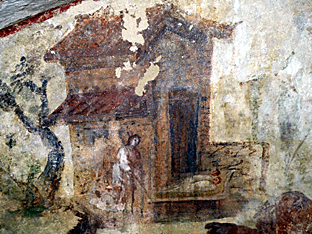 Where, for example, scholars had previously seen (left) the home and the sheep of the father of Odysseus, overcome with grief at the absence of his son, it now seems clear that the fresco actually shows Aurelia Prima untieing her hair in grief at the loss of her two brothers who are lying on the funeral bed within the chamber. Under the sorrowful sister, another scene shows the moment when Odysseus persuades Circe to undo the transformation of his companions, who had been turned into swine, and she witches them back into men. This story from the tenth book of the Odyssey is inserted into a funeral motif because it was Circe who indicated to Odysseus the way to Hades. The new scenes are thus perfectly in line with the multi-religious system of the time and the elaborate syncretism of the Aureli. Yet it is hard to imagine the strands of religious symbolism being woven together in this next scene (below). A mythical hippocampus (a horse with fishy, coiling hindquarters) is seen devouring a small human figure while a naked man looks on, lying relaxed in a bower, a lamp at his side. Hippocamps are a traditional pagan funerary motif (like the Cupids, birds, and peacocks that appear elsewhere on the walls) but one wonders if this creature is not confused with the sea-monster sent to devour Andromeda, which morphed, in turn, in Christian art, into the sea-monster devouring Jonah and then vomiting him up. So, could this be Jonah after his miraculous deliverance from the fish's belly, seated in a booth in the shadow outside Nineveh while he waits to see if God will destroy the city (Jonah 4.5)? That would make it an 'orthodox' painting; wouldn't it? If so, it was not enough. The Tomb of the Aureli, like other heretical Christian catacombs, was not listed in medieval pilgrimage guides. And, still today, we don't really know who was initiated and buried there. Orthodox or not, I guess the medieval church knew better than we who and what had crossed the red line. The paintings in the Tomb of the Aureli depict scenes belonging to the pagan, Jewish, and Christian worlds (both orthodox and heretical). Even taking into account the diverse multicultural nature of Rome in the 3rd century, the richness and variety of the frescoes are astonishing. It reminds me of nothing so much as the immensely varied religious visual (and possibly mystic) experiences of Dura-Europos -- see my post Gods at the Crossroads -- before it was destroyed in 256 CE. With its dozens of temples dedicated to Greek and Roman gods, Mesopotamian deities, Palmyran gods and gads, a Mithraeum, a frescoed synagogue and the earliest Christian house-church anywhere in the world, there was an inevitable and eclectic mixing of images from one religion to another. Palmyra, too, knew many different forms of worship. 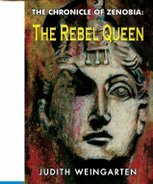 We'll have a look at one new religion that had recently arrived there in my next post, Zenobia and the Manichean Convert. That the tomb continued to be used into the next century makes me a bit sceptical of this identification. Aurelian, notorious for his cruelty, would have left no heir alive. It's possible, of course, that the cult community survived his downfall and continued to use the tomb. But I rather suspect that all of the treasurer's close associates, more than likely also working in the treasury, would have met the same fate. 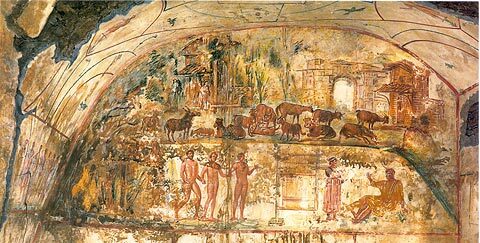 My thanks to David Meadows'blog (RogueClassicism) for alerting me to the newly restored frescoes from the Hypogeum of the Aurelii. 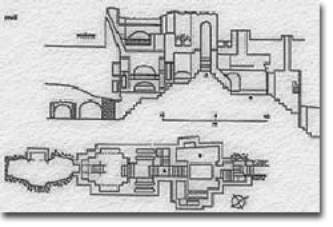 The main sources are the reports in Italian and English in L'Osservatore Romano, 'New discoveries in the hypogeum of the Aurelians, a funeral monument astride two worlds', 10 June 2011; and S. Swain, et.al. Severan Culture, Cambridge, 2007, 277-289. You don't have to link to the carnival, but it'd helpful if you could. In 2000 years' time, won't the works of the Italian Renaissance be interpreted as syncretism? Zoe, how right you are!